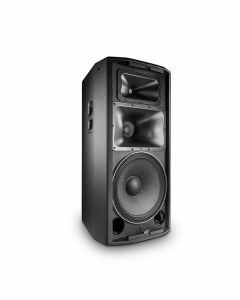 The JBL PRX835W is a full-range speaker built with main system applications in mind. PRX835W provides exceptional volume in a virtually weightless and compact design, while deploying a 1.5” compression driver, powered by a 1500-watt class-D amplifier, as well as a 15” woofer and 6.5” midrange transducer. For assets characterised by subtlety and finesse this speaker is the perfect solution. When combined with the comprehensive low frequencies of the PRX818XLFW it’s possible to attain total control over the whole audio spectrum, although the JBL PRX835W is also fully capable of reproducing high fidelity complete range sound without a subwoofer too. Two EQ selections are available to tailor the system for sound and/or environment, as is the case with all the full-range PRX800 Series systems. The input section is also compatible with line or mic/instrument level inputs. Enjoying the capacity to deliver an industry-leading level of performance over a wide bandwidth with remote Wi-Fi control of on-board DSP EQ parameters, the PRX835W is a self-powered, lightweight three-way loudspeaker system. The speaker houses one 15” 275G Differential Drive woofer, a 2408H-2 37.5 mm (1.5”) annular polymer diaphragm, neodymium compression driver mounted to a 90° by 50° horn and a 165 mm (6.5”) 196H horn-loaded mid-range, all driven by a 1500 watt Audio Class-D power amplifier. Offering user selectable system EQ, protection, input sensitivity selection, cross-over functionality, dynamic limiting and discrete component optimisation, sophisticated DSP is at the foundation of a comprehensive input section. All PRX800 cabinets are safeguarded by JBL’s tour proven DuraFlex finish and constructed from a mixture of 25 mm (on top and bottom for additional durability) and 18 mm rigid poplar lightweight plywood, all reinforced with tongue and groove joints. Handles are built from glass-filled nylon for added strength without increasing weight and the grilles from dent-resistant 16 gauge steel. All M10 suspension points are made from 14 gauge steel and have been tested with a yield-strength of 1000 lbs each. EQ: User selectable presets for Normal or Boost, Advanced EQ settings available using Wi-Fi and PRX Connect application.